- There is parking for two vehicles. Additional parking can be found throughout the community. DETAILS: Walking inside “Blueberry Hill” feels like stepping into an iconic New England beach home! 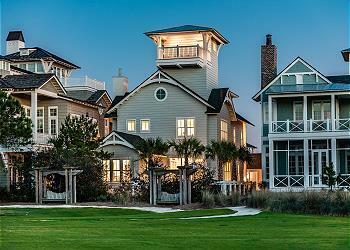 This stunning WaterSound property offers 5 bedrooms, 5.5 bathrooms, and incredible accommodations for 14 guests! Crisp white interiors and blueberry-toned accents throughout the home transport you to summer in Nantucket. An open floorplan allows guests to flow from room to room throughout the home’s main level. The elegant living room is beautifully furnished with plush seating and a large, mounted flat-screen television. Exquisite finishes await in the gourmet kitchen, including marble countertops, a large gas range, and premium stainless steel appliances. The spacious dining table offers seating for 8 guests, and additional seating is available at the adjacent breakfast bar. French doors lead to the screened porch, where guests can enjoy morning coffee and access to the home’s private, sparkling pool. Also on the first floor is a luxurious master suite with a beautifully upholstered king bed and a private en suite bathroom with a soaking tub, a shower, and a dual-sink marble vanity. The second floor presents four stunning guestrooms. The luxurious king master bedroom boasts a large en suite bathroom with a shower and a separate soaking tub. A second king bed guestroom features a private bathroom with a shower. Guests in the third king bedroom can access the shared hallway bathroom with a shower/tub combo, and younger guests will love the bunk room, which offers two sets of twin-over-twin built-in bunk beds. Guests can enjoy a vacation movie night in the home’s third-floor media room, which features a huge flat-screen television, a queen sleeper sectional sofa, and a wet bar. Guests utilizing these sleeping arrangements can also access the shared bathroom and shower. Ascend the final flight of stairs to the fourth-floor lookout tower, which boasts sweeping Emerald Coast views and a wonderful place to feel the ocean breeze. This home is conveniently located just 100 yards from the sugar white sand beach, which beckons you for a day of fun and sun. This classic coastal WaterSound home has it all and is ready to be the place for your dream 30A getaway. Book your stay at the exquisite “Blueberry Hill” by contacting 360 Blue today! Blueberry Hill is a beautiful house in a great location! Perfect for two families with kids. We are so glad that you all enjoyed your time spent at this beautiful home in Watersound! Thank you for staying with 360 Blue, we hope to host you all again very soon!